You've worked hard, and you've impressed the boss: You've been rewarded with a raise, promotion, or both. That's great news. The worst mistake you could make right now is to use this time as an excuse to slack off at work or spend more money. Your new challenge is to figure out how to handle your new responsibilities and your new money in a way that will help you continue to succeed. 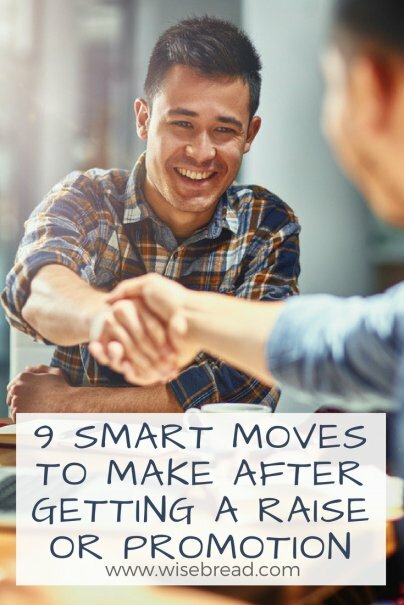 Here are some smart career and money moves to make after your employer rewards you with a raise or promotion. Getting a promotion is a sign that you've been a hardworking, valuable employee. You should pat yourself on the back for your achievement. There's a reason you earned that promotion. There's something that your employer values about you, your decision-making, and your leadership. It's great to feel confident, but don't let this make you cocky. You still have a lot to learn after a promotion. You'll be taking on new duties. Your job description might have swelled. You might even be overseeing others for the first time. Remain humble, grateful, and don't alienate your peers. It's harder to reach your new goals if your co-workers don't like you. Questions are your friend after a promotion. You want to make sure that you understand all that is required of you in your new position. If you have any doubts or confusion on this matter, get concrete expectations and instructions from your superiors. You also want to come up with as many good ideas for improving your company's performance as you can get. Ask your co-workers — even if you are now managing them — for their input on what steps the company can take to improve morale, boost productivity, and compete more successfully in the marketplace. You'll want to reassure your boss that they made the right decision when they promoted you, so put in the hours necessary to show them how dedicated you are to your company. Now is not the time to take extra days off or leave the office early. Instead, work even harder than you did before you earned your promotion. Take the initiative at the next company meeting. Research what new skills would help you thrive in your role, and make a plan to learn them. Not only will this impress your boss, it will help you catch up more quickly with your new duties and responsibilities. Does worker productivity at your office slump after lunch? Is employee morale low? Is a big project behind schedule? Come up with potential solutions to these problems. Crafting new ideas to solve important problems is the best way to show your supervisors that they were right in giving you that promotion. You should always have an emergency fund of savings that you can tap to cover unexpected expenses — whether it's a big vet bill for your dog or a blown gasket in your car. Having such a fund makes it less likely that you'll need to turn to credit cards to pay for an emergency. Too often, people boost their monthly spending as their income rises. They spend more on cars, clothing, entertainment, and meals. The problem is this lifestyle creep can quickly erase any added savings that come with a larger paycheck.